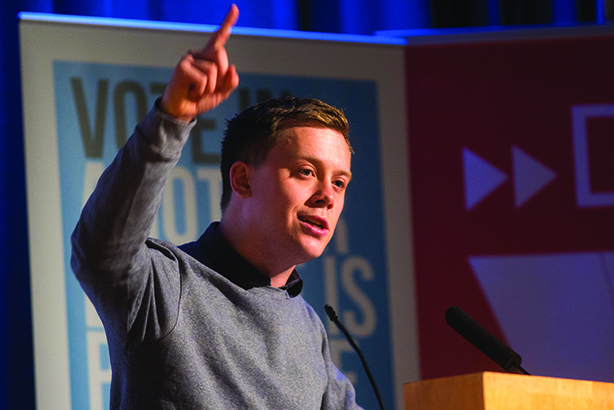 Guardian writer Owen Jones on getting to the point, PRs with a conscience, sushi socialism and the state of British media. An astronaut. Until I was 15 I wanted to be an astrophysicist, though, to be honest, I’m not really sure I knew what an astrophysicist was, but I was quite fascinated by space. I didn’t want to be a writer, that was never what I wanted to be – I write as a means to an end, which is to raise issues, and actually sometimes I don’t like writing, although when things flow, a piece really does write itself. What do you think makes a good PR pitch? I know this sounds pathetic, but I get thousands and thousands of emails and so if people do get in touch by email, if it’s too verbose and there’s a subject line that’s not clear, that’s no good, it needs to get to the point. What is your view of PR people as a whole? I get lots of NGOs and think tanks pushing reports, but not so many corporate titans. It’d be weird if I did, really. I’ve got friends who work in PR, so I don’t have a sense of "oh, PR people are evil", but I think there is a danger that with cutbacks in the media, investigative journalism loses out and the huge expansion of PR creates "churnalism". That really raises questions about democracy, and it is dangerous if firms aren’t being scrutinised, or if a journalist ends up being locked out because they write something negative. Do you have a favourite PR person? I wouldn’t say I have a favourite, but when I speak to a PR I want to know that they’ve got a social conscience, that they’re in it for the right reason and not just to put a shine on dubious practices. What do you make of the state of British media? We’re always told that we have a free press, and while we’re not North Korea, most of our press is run by a very small group of politically motivated moguls – there are some great journalists but I think there is a huge amount that’s worrying. One of the journalists I admire is Peter Oborne – even though he’s conservative, he quit The Telegraph because they refused to cover HSBC, because they were afraid of losing ad revenues; also because he’s written about Islamophobia [and] about other issues. What do you think of some of the new media models that are emerging? One example is The Canary - its 'pay per click' model seems to have been working well for it, but it also really promotes conspiracy theories and a lot of things that just aren’t right. I worry about the Canary-isation of the left, where it ends up in a bizarre sub-culture that anyone who doesn’t agree is seen as part of a conspiracy. But then you do get those blogs on left and right. I think it’s when I write something that demonstrably helps people in some way. So, for example, a piece I wrote a while back about male suicide, where I interviewed a few men who had attempted it – I had a lot of people get in touch who said it was useful. I like raising an issue that people aren’t talking about so much, or that other people aren’t writing about. Otherwise, sometimes you write something and you just think "What is the point of that?" Does anybody have a lunchbox any more? I’ll often go out to Itsu for some sushi. Is this going to be used against me – that I’m a sushi socialist? What most gets in the way of you doing your job? In 2016 – it having been just the worst year ever – moments of total despair. How much of all that – the Brexit vote, then the Trump win – did you see coming? I did a video a few days before [the Brexit vote] predicting it. I wasn’t convinced about Trump, but I thought there was a chance he’d win, and saying that made some people quite angry. So what are your predictions – personal, and political – for 2017? Things are going to get worse before they get better – but I think I have to renew my optimism and never give up, and keep encouraging people to take a stand.